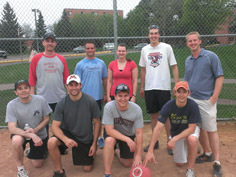 The APWA-MN Student Chapter wrapped up the 2012-2013 school year with the first annual students/professionals kickball game on May 16 at the University of Minnesota, St. Paul Campus Gym Field. Despite a light turnout, nine players made for a very competitive, nine-inning game filled with highlight-reel defense, some close base-running plays, a few rules made up along the way, and a scuffed knee or two. The team of Jake Guzik, Kaylyn Ronke, Eric Seaburg, and Nick Egger held off a late charge by the band of Jeremy Melquist, RJ Kakach, Matt Saam, Justin Messner, and Mitch Hoeft -- winning the game by a final score of 3-2. Thank you to the Student Chapter for organizing the event. It was a great way to cap off the year. We hope when word gets around on campus about how much fun it was, participation will increase next year. Pictured above, front row (left to right): Matt Saam, Jeremy Melquist, Jake Guzik, Eric Seaburg; back row: Nick Egger, Justin Messner, Kaylyn Ronke, R.J. Kakach, Mitch Hoeft.